CACHET Hotel Group (CHG) today announced its plans to debut the Cachet brand in California with the co-branding of the Westlake Village Inn. Westlake Village Inn – a Cachet Hotel marks the first CHG property in the United States and second in Americas. 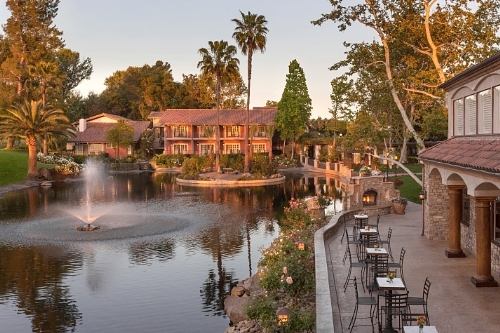 Westlake Village Inn is a European-style hideaway encompassing 17 lush and verdant acres with rose-laden arbors and bougainvillea archways surrounded by its own private lake. The property hosts a 141-room hotel, signature restaurants, an ultra lounge, multiple banquet and meeting rooms, outdoor wedding sites and a vineyard. This co-branding announcement coincides with the completion of a stunning multi-million dollar renovation, including enhanced accommodations, refreshed public spaces and a revamped ultra-lounge. In addition to its reputation as a stylish and lively destination, Westlake Village Inn has established a pedigree by creating and developing its own wine label known as The Stonehaus. Popular amongst the locals and the wine community, the property's exclusive winery is among the best in Southern California, featuring a selection of signature blends including Chardonnay, Pinot Grigio, Cabernet Sauvignon and Pinot Noir. As CHG's strategic partner, The Stonehaus wines will be launched in Asia and in Mexico, beginning with CHG's award-winning steakhouse restaurant Porterhouse by Laris in Hong Kong and in CHG's luxury resort Cachet Corazon in Cabo San Lucas, Mexico. Owner and Developer of Westlake Village Inn, John L. Notter, has driven this partnership as the company's key investor and inaugural member of its advisory board. An international financier and developer, Mr. Notter served as member of the Board of Directors at Hilton Hotels Corporation and was chairman of the Audit Committee. He currently serves as chairman of the board for the Ludwig Institute for Cancer Research, an international community of distinguished scientists dedicated to preventing and controlling cancer, and as a trustee of the Virginia and D.K. Ludwig Fund for Cancer Research. Westlake Village Inn – a Cachet Hotel will be featured on CHG's proprietary and revolutionary technology platform, CachetWorld. By joining CHG's brand portfolio and international network of hotels and resorts, CachetWorld will give Westlake Village Inn access to a digital lifestyle community that features a search and booking engine for boutique and lifestyle hotels and high-end residences worldwide. Its wide reach will attract international guests from Asia as well as continue to drive local business for the property. For more information about Westlake Village Inn, visit www.cachethotelgroup.com. Cachet Hotel Group (CHG) is a Hong Kong-based hospitality branding company. CHG's mission is to be the most innovative and socially responsible hospitality company in Asia. With numerous projects under development, CHG is focused on establishing properties in Greater China, Southeast Asia, Northeast Asia and the Americas.